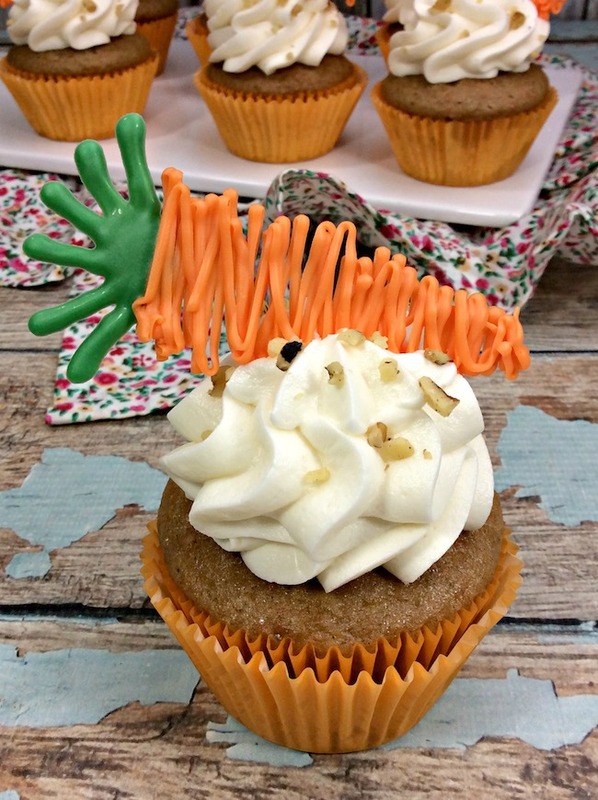 Carrot Cake Cupcakes Recipe with Chocolate Carrots | Be Plum Crazy! 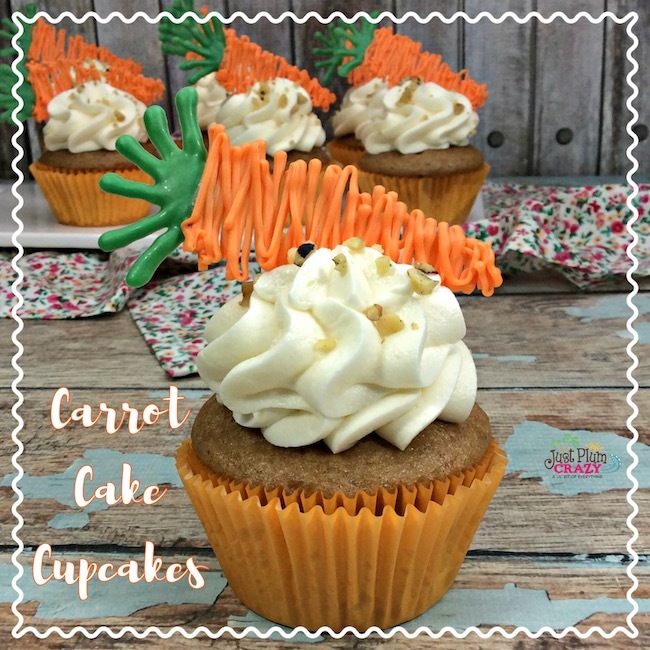 The Carrot Cake Cupcakes Recipe with Chocolate Carrots is brought to you by Just Plum Crazy. 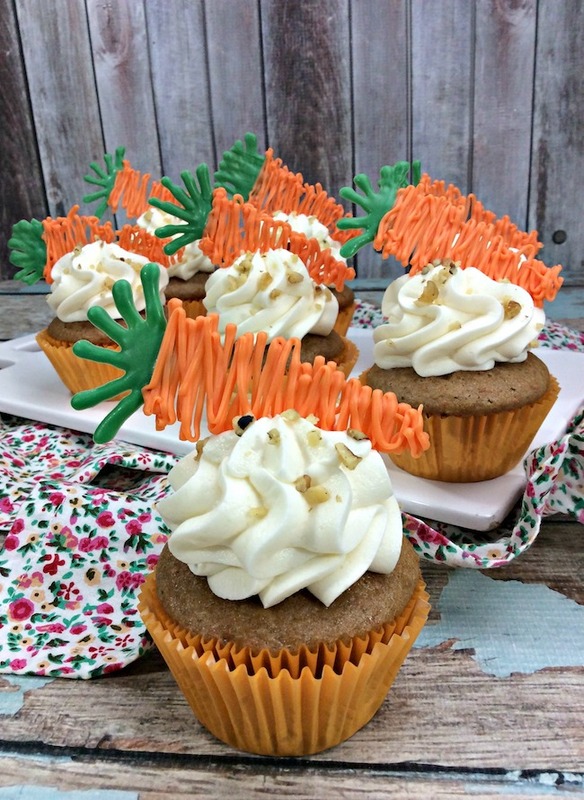 Carrot Cake Cupcakes Recipe with Chocolate Carrots! Carrot cake isn’t only for Easter, but since it’s early this year, we are sharing a Carrot Cake Cupcakes Recipe with Chocolate Carrots. Sounds yummy, don’t it? In honor of National Carrot Cake day, we thought it fitting to share the perfect recipe for it. 3. In a standing mixer, beat cake mix butter, milk, vanilla and eggs on medium speed for 2 minutes. 4. Mix in the shredded carrots and chopped pecans. 5. Pour cupcake batter into cupcake liners, filling each about 3/4 full. 6. Bake in the oven for about 21 minutes. 1. Cream together the cream cheese and the butter in the bowl of a stand mixer. 2. Add the powdered sugar one cup at a time. 3. Then add in the vanilla extract and heavy whipping cream. 4. Continue to mix until stiff peaks form. 5. Scoop into your piping bag fitted with a star tip. 6. Frost your cupcakes and set aside. 7. Take your cookie cutter and trace the shape of the carrot onto the parchment paper on the cookie sheet. 8. Using a double boiler, melt your orange candy melts. 9. Once melted, scoop into a disposable bag and set aside. 10. Wash out your double boiler and dry throughly before melting your green candy melt. 11. Once melted, scoop into the disposable piping bag. 12. Cut the tip off your green piping bag and pipe a zigzag going up and down for the carrot stem. 13. 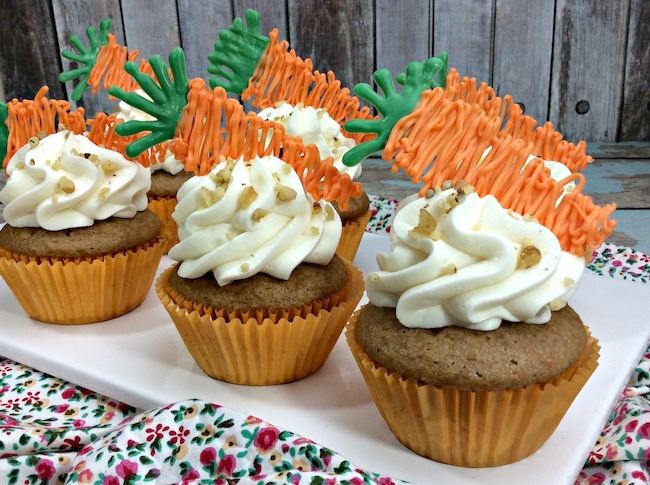 Cut the tip off the orange piping bag and drizzle the lines descending on your carrot going from the top to the bottom. 14. 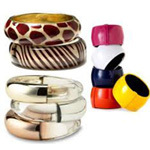 Place into the freezer for 10 minutes so that the candy can harden. 15. Once hard, carefully peel off and place onto the frosting. Mix in the shredded carrots and chopped pecans. Scoop into your piping bag fitted with a star tip. Frost your cupcakes and set aside. Using a double boiler, melt your orange candy melts. Once melted, scoop into a disposable bag and set aside. Wash out your double boiler and dry throughly before melting your green candy melt. Once melted, scoop into the disposable piping bag. Cut the tip off your green piping bag and pipe a zigzag going up and down for the carrot stem. Once hard, carefully peel off and place onto the frosting.